USB (Universal Serial Bus) is, simply said, a wiring scheme that carries data and electrical power. About the only thing you need to know is which end is up, and which end is micro. The USB cable that came with your tablet is standard. If you need a replacement, you can get one from a computer store or an online seller. Plug the micro end of the USB cable into your tablet. The micro end of the cable is the small connector. It fits in only in one way. Don’t force it. Remove the larger end of the cable from the AC adapter. Put the small adapter somewhere where you’ll be able to find it again. Attach the larger end of the USB cable to a port on your current desktop or laptop computer. It, too, only goes in a particular way. At the computer end, you need to match the open side of the connector to the block side on the port. Open to block; block to open and you’re in like Flynn. If you’re one of the lucky ones, that’s all that needs be done. If not, you should see a message on your computer (not on the tablet) telling you that it needs to install a driver in order to recognize this new piece of hardware now attached. The computer should be able to do this all by itself. If you run into trouble, call Samsung or Barnes & Noble for help. When you make the USB connection, you should see a message on your tablet. For a closer look, swipe down from the top to display the notification panel. Tap the Media Device option. This option is best for moving files to or from your Tab 4 NOOK. Mac users may need to install a small, free utility on their computer. Find your tablet in the File Explorer (on the PC) or the Finder (on a Mac). On the computer, click to open the tablet. You’ll find one top level for the tablet and one for the card you may have (should have) installed in the expansion slot. 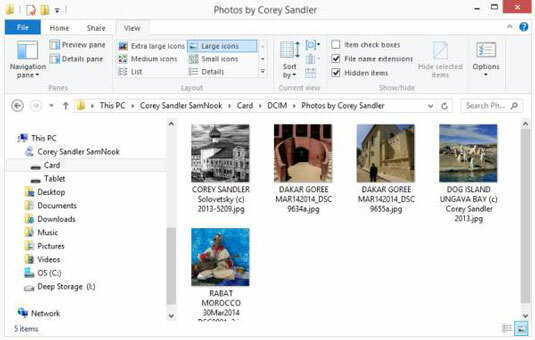 On a Windows machine, you can right-click a folder or virtual drive to read more about its properties and how much data is stored within. You might see the tablet referred to by its model number; the first edition of the Samsung Galaxy Tab 4 NOOK is the SM-T230NU. 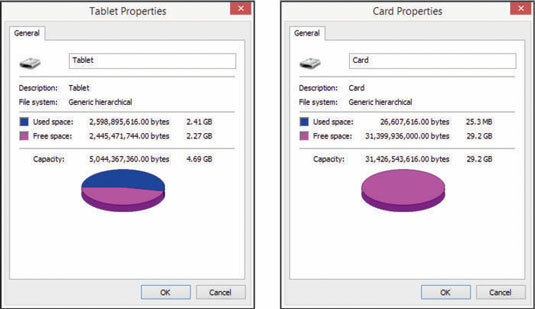 If you’re going to add files from the PC to the tablet, in most cases you will want to install them on the card; it has more space. You can create any folder you want. Create new ones on the external memory card instead. Any PNG or JPG file goes in the Gallery. 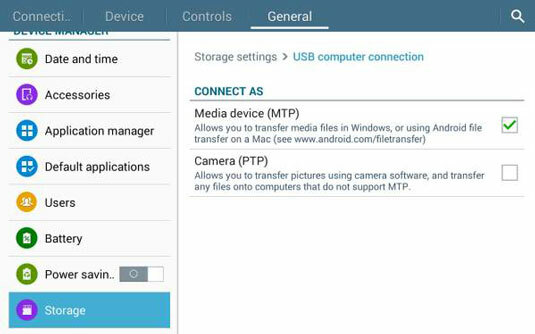 Photos you take with your tablet’s built-in camera are stored in the DCIM folder. Other folder names are more obvious: Music, Movies, Documents. NOOK eBooks are stored in the NOOK folder. Files you’ve downloaded to the tablet are in Downloads. Files created using some apps are in Documents. Some apps create their own folders, including Overdrive for library books and Kindle for reading material from Amazon’s store. 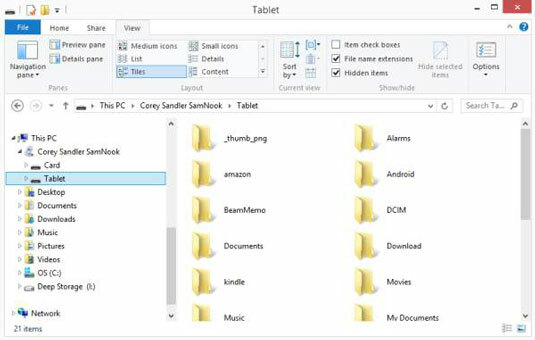 Open a folder on the tablet or its card and rename or delete files. Drag and drop files from the PC to the tablet, or the other direction. Copy files on a PC or Mac, move the cursor to a folder on the tablet, and paste them there. Drag and drop entire folders in one direction or the other. Check out the basic file structure of the tablet itself. If you’re connecting your Tab 4 NOOK to a Macintosh computer, you must eject the tablet’s Disk icon before you can turn off USB storage on the Tab and remove the cable. Windows users can simply unplug the cable without any extra steps.